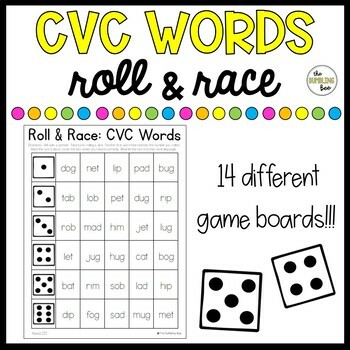 This CVC word game is perfect for your students to practice blending, segmenting, decoding, letter ID, and writing! Students will roll a dice and use that number to determine what CVC word to read aloud. They will then practice writing that word on their recording sheet. If they read it correctly they get to cover that square up with a counter. You can also put these in a sheet protector and have students use a marker to cross out their box. They can play with a partner, individually, teacher vs. class, etc! There are 14 GAME BOARDS in all! 2 for A, E, I, O, U, and 4 with a mix of them all! **If you are interested in seeing what the game board looks like go check out my freebie roll and race!